In July 1950, the first rocket launched into space from Port Canaveral, projecting into the cosmos as onlookers watched in awe. Since then, a new chapter in space exploration was opened and the Space Coast became home to all NASA-launched spaceflights to this day. 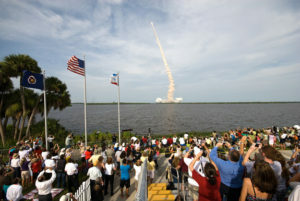 Thousands of visitors flock to the area each year to catch a glimpse of these momentous launches and be inspired by the thrill of space discovery. If you are planning your next rocket viewing adventure, we know just the spots to get the best view of the launch and have the most unforgettable experience. Kennedy Space Center is your home for space adventure, from exhibits and memorabilia, to IMAX theaters and simulated space rides. It also has two prime viewing locations of rocket launches at the Saturn V Center and LC-39 Observation Gantry. The Saturn V Center has plenty of attractions, shopping, and restaurants to enjoy while awaiting the big send-off, as well as a live launch commentary. Or head to the LC-39 Observation Gantry, a four-story structure offering premium view of all three launch pads. This spot located within the Kennedy Space Center offers an up-close and personal view of all three launch pads across the Indian River. It’s a great spot to bring family and friends for a picnic and viewing party. Pack your hats, blankets, and umbrellas and keep cool in the wide-open space of the NASA Causeway. Ranked one of the busiest cruise ports in the world, Port Canaveral is teeming with excitement at every turn. Head to the Exploration Tower for a breathtaking panoramic view of the ships and of Kennedy Space Center. 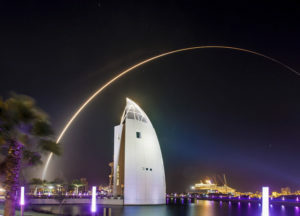 Watch the launch from the 7th floor of the observation deck and use high-end telescopes to get a detailed view of the rocket before and during launch. For a more remote viewing experience, Rout 401 is a prime spot to watch from the comfort of your car. Or head further down to 528 on the Banana River where you can spread out with an RV and make it a day affair. Talk a stroll through Jetty Park, one of NASA’s recommended viewing locations. Boaters can watch the launch from the Intracoastal Waterway and non-restricted areas of the Indian River and Mosquito Lagoon. Located on the shores of the Atlantic Ocean, Alan Sheppard Park and Sidney Fischer Park offer off-beach parking, suitable facilities, and a spectacular view of the launches. Bring the kids to enjoy the playground until launch time and pack snacks to enjoy at the conveniently located picnic tables. If you’re looking for a beach experience while you watch the launch, head to Playalinda Beach. It’s one of the best and closest locations for viewing, specifically for the Atlas V and Falcon 9 launches. 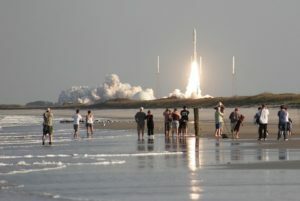 It’s one of the few places on the planet where you can enjoy the beach while catching a glimpse of space exploration. If you just want to make a quick stop to catch the launch before heading to your next destination we have a few spots along the road with a phenomenal view. Enjoy the excitement from the comfort of your vehicle by visiting these roadside locations. Use caution when pulling off the road and make sure you’re not impeding the flow of traffic.